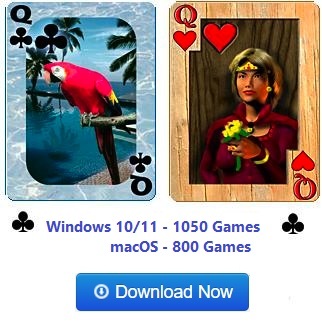 Screen shot of the game Cruel from Pretty Good Solitaire. 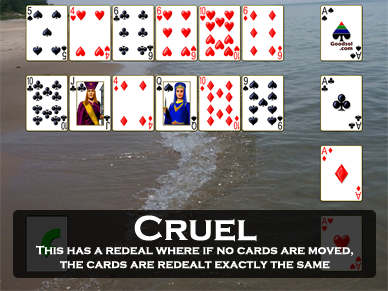 Cruel is an entertaining 1 deck game with 12 piles in the tableau. 4 cards are dealt to each pile at the beginning of the game and the 4 aces are placed as bases for the foundations. Only the top card of each tableau pile is visible or available for play. The 12 piles are built down by suit. The object is to move all the cards to the foundations. 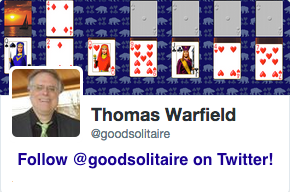 To do this, you have to build on the 12 piles to free up cards for the foundations. When you get stuck, you can redeal to the 12 piles. You can redeal as many times as you like, but there's a catch. Cruel's redeal is not a reshuffling of the cards. 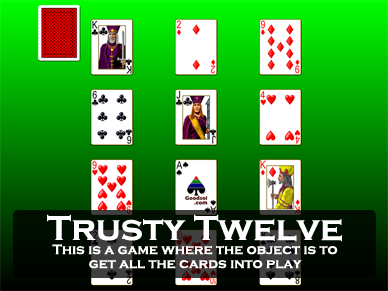 All the cards in the 12 piles are picked up and redealt essentially in order, so that if you do not make any changes to the 12 piles between redeals, the order of the cards will not change. This is what makes the game cruel. Just when you think you are making progress and are going to win, you run out of moves and do a redeal and the cards come out with no moves to made. When that happens, you are out of luck. An average player can win Cruel about 20% of the time. A good player can win 50% or more, however. The key is to take steps to avoid a loss by having a redeal come up with no possible moves. Remember that you don't have to play a card to the foundations even if you can. Sometimes you may want to hold cards back from the foundations, so that you can make moves in the tableau and avoid getting caught with no moves to make in the tableau, which loses the game.